2016 NRL Final Trimester Report Part 4 – There can be only one! Always happy to start with a Highlander reference. Even though the GF is done and dusted (congratulations to the Sharks, it has been a long road), I am continuing my Final Trimester Report. A couple of weeks ago I covered the teams finishing 5th to 8th. The week before it was 9th to 12th and the week before that teams finishing 13th to 16th. This week it’s the top tier, teams finishing 1st to 4th. The Cows were the best placed team in a long while to repeat and the fact they didn’t is testament to how very hard it is to do so. Their campaign wasn’t derailed by injuries, in fact, they had a very good run losing only the occasional player. JT was immense all season long. Jason Taumalolo was even more immense, if possible. The forward pack laid a solid platform. They had strike power in the backs. They had secondary playmakers on both sides of the ruck in Michael Morgan and Lachlan Coote to supplement JT and a threat from dummy half in Jake Granville. Good depth in John Asiata, Coen Hess and Kalyn Ponga (the League of Extraordinary Gentlemen isn’t as high on Kalyn as I am). They won their last 3 going into the finals. Paul Green had them well prepared. In the end they came up against a very committed Cronulla side and that was it. 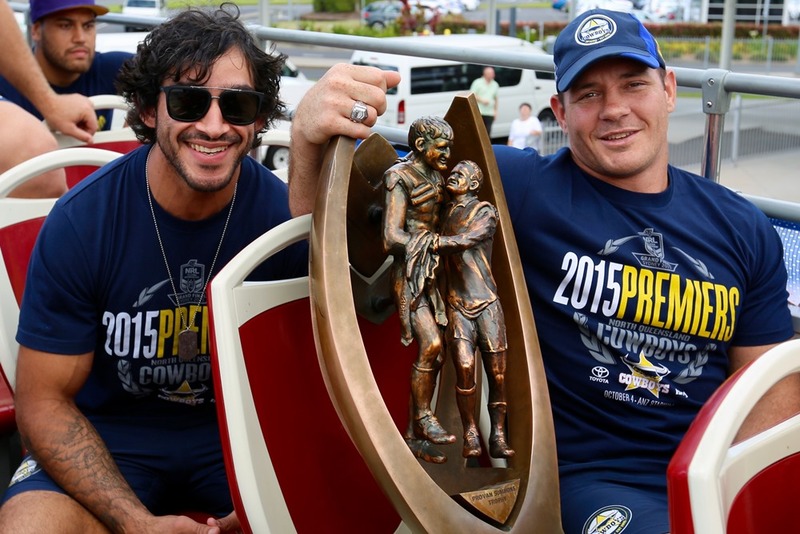 Jason Taumalolo – It is pretty tough when you fall from being the best player in the world to being the second best JT in your team but Johnathon Thurston was narrowly shaded this year by the runaway truck AKA Jason Taumalolo. I thought the Cows would finish 1st. The Bookies thought they would finish 2nd. Both were not far off the end result. Six consecutive finals campaigns (tied with Melbourne for the longest current streak) is a fair return and that should continue in the immediate future. They don’t have to change that much for next year’s campaign either. James Tamou is their only significant loss and they have a fair crop of talent coming through to add depth. They have a nice blend between youth and experience and injuries have been kind, as previously mentioned. Next season should be very similar to this one and is shaping as an even competition again so I expect the Cows will be a good shot at another premiership. The bookies have them as favourites in the ‘ridiculously too soon’ market for 2017. By then they are either on the line looking for a dummy half play between Michael Ennis and Luke Lewis or James Maloney, Chad Townsend or Ben Barba are looking for opportunities around the edges or making plays for their outside backs. Their 15 game winning streak came to an end in a draw against the Titans in round 18 and they followed that by losing 4 of their last 5 games which looked deceptively like they had peaked too early. The first round of the finals looked ominous too against the Raiders but they managed to squeak home and after that, momentum took over. Ben Barba 2.0 – All the way back from his post-2012 meanderings in injury and mediocrity, Barba was rewarded with a premiership. At the start of the season there was talk that Jack Bird would supplant him at fullback so polling the most points in the Dally M for Cronulla is a fair effort. I’m rubbing the bookie’s nose in it this time. I had the Sharks finishing 4th. The bookies had them missing the finals at 9th. The quest to find a repeat premier in the salary cap era continues. We know for sure they won’t have Michael Ennis but they’ve managed to prise Manaia Cherrington from the Tigers which is a big, big boon for the Sharks, especially given they lost Michael Lichaa a few seasons back. Other than that they look like retaining nearly every player in their first grade squad, although Luke Lewis is off contract. There is no reason why the Sharks can’t repeat but it will depend on injuries and finding form at the right end of the season again. The gap between the top sides is so infinitesimal now, it is almost impossible to predict with certainty. They hit the final series on the back of ten straight wins and a couple of mistimed injuries derailed their season. Losing Josh Hodgson during the second half of their Quarter Final against the Sharks opened the doorway for that loss and Joey Leilua and Jarrod Croker were hobbled for most of the Preliminary Final against the Storm and they still only lost that match by 2 points. Ricky Stuart had a dreadful time at Parramatta but the Raiders are building towards something special. Josh Hodgson – Without a doubt Canberra’s best player with honourable mention to Leilua and Jordan Rapana. Hodgson is integral to Canberra’s attack both around the ruck and his laser like passes on both sides but it his running game which opens up so many options for his outside backs, keeping sides honest around the ruck area. Missed by a little bit (7th) but the Bookies were plotting Ricky Stuart’s downfall (12th). Reports of his demise were greatly exaggerated. Apart from Southern NSW I’m pretty sure the balance of Canberra’s recruiting efforts are based in England now. This time they’ve recruited Jordan Turner from St Helens who they hope will emulate the success of Josh Hodgson and Elliott Whitehead. You can add Iosia Soliola who they retrieved from the Old Dart as well. They’ve held on to pretty much most of their top team and should build on their 2016 campaign. Of course it all starts again but they should find themselves in the top 4 next season from the start. Minor Premiers and one pass from being Premiers is not too shabby. I kept waiting for the Storm to fall in a heap this year but they just kept getting better and better, even without Billy Slater. To be fair, he was probably the only one of the Big ThreeTM with a ready-made replacement in Cameron Munster but he was still a vital cog to what the Storm did (BTW I thought they really missed him in the GF). How did they do it? Cameron Smith and Cooper Cronk played otherworldly. Craig Bellamy continued to eke every last bit out of his team. Suliasi Vunivalu came from nowhere to top the try scoring charts with Jordan Rapana (23). Cheyse Blair was another re-tasked player that significantly added to his contractual value. Cooper Cronk – A bit stymied in the GF, but that was more Cronulla’s doing, Cronk had a whale of a season and deservedly won the Dally M Medal, along with Jason Taumalolo. Ironically in my pre-season preview/super hero mashup I compared the Storm to Professor X as I predicted the Storm to fall out of the top 8 (10th) but like everyone seems to underestimate Professor X, everyone underestimated the Storm (or at least I did). I’m not the only one who thought they were on the decline though as the Bookies thought 8th was about right. Both really wrong but I was more wrong. My two greatest regrets this year, as far as prognostications were concerned, were overrating the Warriors and underrating the Storm. Eventually we will see a decline in Cooper Cronk and Cameron Smith but after predicting this for 2 years I’m going to ease off predicting when. They could be the best in their position in 2025 for all I know. I’m thinking Billy Slater is just about done. Injuries have been cruel. Everyone else on the roster is revitalised. They are replacing Marika Koroibete with the equally devastating Josh Addo-Carr which is a good get and they’ve poached the underrated Jahrome Hughes from NQ to replace Blake Green. Nearly everyone else has reloaded so I think it will be situation normal for the Storm. They should make it 7 straight appearances in the finals and should also contend for the GF. I’ve learned my lesson. Never, ever underestimate the Storm. Only the third time in history teams have won their first premiership in consecutive seasons (Newton 1910 and Eastern Suburbs 1911 and Penrith 1991 and Brisbane 1992 were the other two occasions). In 2014 I predicted the following order for teams that hadn’t yet won a premiership at the time (Cowboys (2-3 years), Warriors (5-10 years), Sharks (7-8 years) and then Titans (ten plus years). I’m thinking I need to do some re-calibration posts for the Warriors and Titans. The Sharks have shown just how quickly a team can turn things around in the salary cap era. I can understand why most of the NRL teams (except Cronulla and the Broncos) have pulled out of the World Club Championship but it is a poor look. It would have been better to cancel the games earlier in the season than have them under-subscribed at this late juncture. Next exciting episode will be on Friday, 4 November 2016 titled ‘2016 NRL Season Review – this is the last time I talk about it, I promise’. This entry was tagged Australia, England, New Zealand, NRL, Rugby League. Bookmark the permalink.